HyeFighter USA Olympian Vanes Martirosyan of Glendale, Calif. knows all about his next opponent, Mean Joe Greene of New York. “Years ago we were on the same USA Jr Olympic team,” said Vanes, who takes on Greene on Top Rank’s big Stadium Slugest card featuring Miguel Cotto vs. Yuri Foreman on June 5 at Yankee Stadium. “I was fighting at 145, he was around 160. We were friends, although we never fought. “As a pro, Greene has a difficult style. 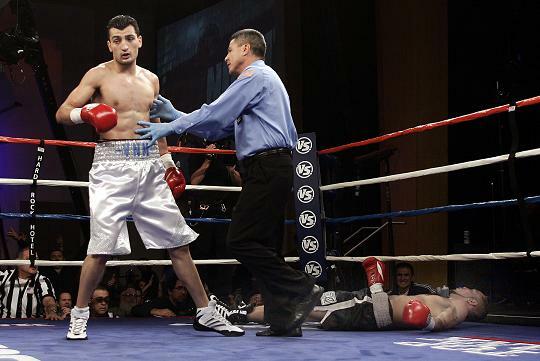 We’ve looked at lot of recent video of him,” said Martirosyan, a super welterweight. “I’ve been training with Freddie Roach for the last eight weeks at the Wild Card Gym. We’ve had a lot of sparring — 10 rounds yesterday for example. I’m in top condition and ready to fight.” Martirosyan is 27-0, Greene 22-0. The Martirosyan vs. Greene fight will be televised live on HBO (10:15 pm eastern) as a prelude to the Stadium Slugfest battle between Cotto vs. Foreman.